Cole's renowned four–part series traces the journey of an archetypal hero along the "River of Life." Confidently assuming control of his destiny and oblivious to the dangers that await him, the voyager boldly strives to reach an aerial castle, emblematic of the daydreams of "Youth" and its aspirations for glory and fame. As the traveler approaches his goal, the ever–more–turbulent stream deviates from its course and relentlessly carries him toward the next picture in the series, where nature's fury, evil demons, and self–doubt will threaten his very existence. Only prayer, Cole suggests, can save the voyager from a dark and tragic fate. From the innocence of childhood, to the flush of youthful overconfidence, through the trials and tribulations of middle age, to the hero's triumphant salvation, The Voyage of Life seems intrinsically linked to the Christian doctrine of death and resurrection. Cole's intrepid voyager also may be read as a personification of America, itself at an adolescent stage of development. The artist may have been issuing a dire warning to those caught up in the feverish quest for Manifest Destiny: that unbridled westward expansion and industrialization would have tragic consequences for both man and nature. Sold by the artist to George K. Shoenberger [1809-1892], Cincinnati, perhaps as early as 1845 and no later than May 1846; Shoenberger heirs, after 20 January 1892; purchased 1908 by Ernst H. Huenefeld, Cincinnati; gift 1908 to Bethesda Hospital and Deaconess Association of Methodist Church of Cincinnati; sold 17 May 1971 through (Hirschl & Adler Galleries, New York) to NGA. For a discussion of a possible 1845 date, see Thomas Cole, Exh. cat. Memorial Art Gallery of the University of Rochester, 1969: 35. Other sources place the acquisition a bit later than 1845; see Paul D. Schweizer, "The Voyage of Life: A Chronology," in The Voyage of Life by Thomas Cole, Paintings, Drawings, and Prints, Exh. cat. Museum of Art, Munson-Williams-Proctor Institute, Utica, New York, 1985: 45 ("December 1846? "), and Ellwood C. Parry III, The Art of Thomas Cole: Ambition and Imagination, Newark, Delaware, 1988: 332 ("sometime late in 1846 or, more likely, early in 1847"); however in a Boston Transcript article entitled "The Voyage of Life," which appeared 21 May 1846, the pictures are mentioned as then belonging to "a wealthy gentleman of Cincinnati." A letter of April 1979 from Mrs. Robert Heuck (in NGA curatorial files) specifies: "Mr. Shoenberger died in 1892, at which time many of the belongings of the home were given to heirs." Shoenberger died 20 January 1892; for additional information, see The Biographical Cyclopaedia and Portrait Gallery with an Historical Sketch of the State of Ohio, 6 vols., Cincinnati, 1895: 6:1457-1458. Mrs. Robert Heuck, letter of April 1979 (in NGA curatorial files) states: "In 1908 Mr. and Mrs. Ernest W. [sic] Huenefeld purchased the land [and the house and contents]." Edward H. Dwight and Richard J. Boyle, "Rediscovery: Thomas Cole's 'Voyage of Life'," Art in America 55 (May 1967): 62. Annual Exhibition of Modern Artists, Piazza del Popolo, Rome, 1842, no cat. Private Exhibition, Luther Terry's studio, Orto di Napoli, Rome, 1842. Pictures by Thomas Cole N.A. ... The Voyage of Life! A Series of Allegorical Pictures, National Academy of Design, New York, 1843-1844, no. 1. Second Exhibition, Boston Artists' Association, 1843, no. 1. Paintings Exhibited..., Pennsylvania Academy of Fine Arts, Philadelphia, 1844, no. 1. Western Art Union, Cincinnati, 1848, no cat. Pictures at the Ladies' Gallery, Cincinnati, 1854, 2 and 5, no. 20, as Infancy. A New World: Masterpieces of American Painting 1760-1910, Museum of Fine Arts, Boston; Corcoran Gallery of Art, Washington, D.C.; Grand Palais, Paris, 1983-1984, no. 25, repro. 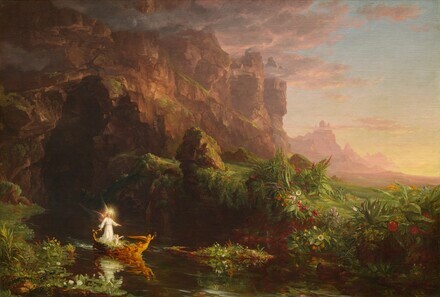 The Voyage of Life by Thomas Cole, Paintings, Drawings, and Prints, Museum of Art, Munson-Williams-Proctor Institute, Utica, New York, 1985, 4, 5, 28, 30-32, 34-36, 38-40, 42, 44, 45, 48, 53, 66-69, no. 33. Thomas Cole: Landscape into History, National Museum of American Art, Washington, D.C.; Wadsworth Atheneum, Hartford; The Brooklyn Museum, 1994-1995, fig. 115. Loan for display with permanent collection, The Detroit Institute of Arts, 1995-1996. Explorar el Edén: Paisaje Americano del Siglo XIX, Fundación Colección Thyssen-Bornemisza, Madrid, 2000-2001, no. 2, repro. Secondary ground layers include red under the top left corner; yellow under the boat and angel; red under the center in the light area of mountain; red under top right corner in the light area of sky; red under the water around the boat. Infrared reflectography reveals some underdrawing of mountain contours in the right middle and far distance. There are scattered small losses along the edges, a small loss below the boat, and craquelure throughout. All four paintings in The Voyage of Life series were executed on herringbone twill fabric with moderately fine threads and a moderately rough surface. The paintings were lined (apparently for the first time) and the original panel-back stretchers were replaced during treatment in 1970-1971. The presence of unused tack holes and the pattern of wear on the canvas edges suggest that the paintings were originally stretched and painted on slightly larger stretchers, and then restretched by the artist on the panel-backed stretchers. All four paintings have white ground layers; in specific areas of each painting (see individual comments, below) secondary ground layers of different colors were applied. Infrared reflectography reveals only minimal underdrawing. Paint was applied moderately thinly and with low and broad brushstrokes in some areas such as the skies, and more thickly and with some high impasto in details such as the figures and foliage. In general, the paintings are in excellent condition, with only scattered small losses, some craquelure, and minor abrasion. In 1970-1971, discolored varnish was removed and the paintings were restored. "Cole's Pictures at the National Academy of Design." Anglo American (30 December 1843): 239. "Dottings on Art and Artists. No. II." New World 6 (25 February 1843): 246. "Mr. Cole's Paintings." New-York Daily Tribune (26 December 1843): 2. New-York Daily Tribune (18 February 1843): 3. "A Few Words About Mr. Cole's Paintings." New World 8 (17 February 1844): 217. "Cole's Paintings." New-York Daily Tribune (9 January 1844): 2. "Editor's Table." The Knickerbocker 23 (January/February 1844): 97, 196. P., S.H.J. "To Thomas Cole." New Mirror 2 (27 January 1844): 269. Transactions of the Western Art Union for the Year 1847. Cincinnati, 1847: 25. Bryant, William Cullen. A Funeral Oration, occasioned by the death of Thomas Cole delivered before the National Academy of Design, New York, May 4, 1848. Philadelphia and New York, 1848: 30. Whitley, Thomas W. Reflections on the Government of the Western Art Union and a Review of the Works of Art on Its Walls. [Originally published in the Herald of Truth] Cincinnati, 1848: 17-18. Lanman, Charles. "The Epic Paintings of Thomas Cole." Southern Library Messenger 15 (June 1849): 353. Transactions of the Western Art Union for the Year 1848. Cincinnati, 1849: 10. Noble, Louis Legrand. The Course of Empire, Voyage of Life, and other Pictures of Thomas Cole, N.A.. New York, 1853: 295-298, 301, 309, 312-314, 317, 320-322, 353, 359. "Thomas Cole." National Magazine 4 (April 1854): 318-321. "Sketchings." The Crayon 1 (7 February 1855): 92. "Notes and Gleanings--Cole's Pictures of Life." National Magazine 13 (September 1858): 284-285. Green, George W. Biographical Sketches. New York, 1860: 101, 105, 110-112. "The Artists of America--Taken from New American Cyclopaedia." The Crayon 7 (February 1860): 46. Cummings, Thomas S. Historic Annals of the National Academy of Design (1825-1863). Philadelphia, 1865. Reprint, New York, 1965: 170, 176, 201. Mayer, Frank Blackwell. With Pen and Pencil on the Frontier in 1851: The Diary and Sketches of Frank Blackwell Mayer. Edited by Bertha L. Heilbron. Reprint, Saint Paul, 1932: 41. La Budde, Kenneth James. "The Mind of Thomas Cole." Ph.D. dissertation, University of Minnesota, Minneapolis, 1954: 171, 212. Devane, James. "Sightseers Have Visited Scarlet Oaks for 95 Years." Cincinnati Enquirer (20 May 1962): 6A. Noble, Louis Legrand. The Life and Works of Thomas Cole (1853). Edited by Elliot S. Vesell. Cambridge, Massachusetts, 1964: 220-224, 231, 233-235, 237, 239-240, 264. Dwight, Edward H., and Richard J. Boyle. "Rediscovery: Thomas Cole's 'Voyage of Life'." L'Art et les Artistes 55 (May 1967): 60-63, repro. 62. Merritt, Howard S. "Thomas Cole's List, 'Subjects for Pictures.'" In Baltimore Museum of Art, Annual II: Studies on Thomas Cole, an American Romanticist. Baltimore, 1967: 84, 90. Riordan, John. "Thomas Cole: A Case Study of the Painter-Poet Theory ofArt in American Painting from 1825-1850." 2 vols. Ph.D. dissertation, Syracuse University, 1970: 1:99-100; 2:345, 455-497. Wallach, Alan Peter. "The Ideal American Artist and the Dissenting Tradition: A Study of Thomas Cole's Popular Reputation." Ph.D. dissertation, Columbia University, New York, 1973: 70-72, 106. Kurland, Sydney. "The Aesthetic Quest of Thomas Cole and Edgar Allan Poe: Correspondence in their Thought and Practice in Relation to their Time." Ph.D. dissertation, Ohio University, Athens, 1976: 105-109, 172, repro. 227. Wallach, Alan. "The Voyage of Life as Popular Art." The Art Bulletin 59 (1957): 234. American Paintings: An Illustrated Catalogue. National Gallery of Art, Washington, 1980: 133, repro. Coen, Rena N. "Cole, Coleridge and Kubla Khan." Art History 3 (June 1980): 218, 227, pl. 31. Wilmerding, John. American Masterpieces from the National Gallery of Art. National Gallery of Art, Washington, D.C., 1980: 11, 14, 88, repro. 88. Virdis, Caterina Limentani. "Paesaggio e racconto in Edgar Allan Poe." Artibus et Historiae 4 (1981): 90, 94, repro. 89. Williams, William James. A Heritage of American Paintings from the National Gallery of Art. New York, 1981: color repro. 96, 112-113. Schweizer, Paul D. "Another Possible Literary Source for Thomas Cole's Voyage of Life." In "New Discoveries in American Art." Edited by Jayne A. Kuchina. The American Art Journal 15 (1983): 74-75. The Voyage of Life by Thomas Cole, Paintings, Drawings, and Prints. Exh. cat. Museum of Art, Munson-Williams-Proctor Institute, Utica, New York, 1985: 66-69. Sarnoff, Charles A. "The Voyage of Life Had a Life of Its Own." Paper presented to the NGA, January 1987. Wilmerding, John. American Marine Painting. Rev. ed. of A History of American Marine Painting, 1968. New York, 1987: 44, 46, 47, color repro. 42. Parry, Ellwood C., III. The Art of Thomas Cole: Ambition and Imagination. Newark, Delaware, 1988: 218, 228, 265-268, 270-272, 275, 277, 280, 284-285, 291-298, 301-303, 332, 338, 378. Wilmerding, John. American Masterpieces from the National Gallery of Art. Rev. ed. National Gallery of Art, Washington, D.C., 1988: 11, 17, 102, 103, repro. 102. Powell, Earl A., III. Thomas Cole. New York, 1990: 103. Kopper, Philip. America's National Gallery of Art: A Gift to the Nation. New York, 1991: 261, 263, color repro. Wilmerding, John. American Views: Essays on American Art. Princeton, 1991: 56, 67, repro. 57. American Paintings: An Illustrated Catalogue. National Gallery of Art, Washington, 1992: 145, repro. Truettner, William H., and Alan Wallach. Thomas Cole: Landscape into History. Exh. cat. Natl. Mus. of Am. Art, Wadsworth Atheneum, Hartford; Brooklyn Museum. Washington,1994: 42,46-47,79,82,84,98-101,113,130-133,138,144,149-150,152,154,182, no. 115. Apostolos-Cappadona, Diane. The Spirit and the Vision: The Influence of Christian Romanticism on the Development of 19th-Century American Art. Atlanta, 1995: 137-148, fig. 26. Kelly, Franklin, with Nicolai Cikovsky, Jr., Deborah Chotner, and John Davis. American Paintings of the Nineteenth Century, Part I. The Collections of the National Gallery of Art Systematic Catalogue. Washington, D.C., 1996: 95-108, color repro. Boeckl, Christine M. “Path/Road/Crossroads." In Encyclopedia of Comparative Iconography: Themes Depicted in Works of Art. Edited by Helene E. Roberts. 2 vols. Chicago, 1998: 2:692. Hand, John Oliver. National Gallery of Art: Master Paintings from the Collection. Washington and New York, 2004: 308-310, no. 247, color repros. "Rethinking 'Luminism': Taste, Class, and Aestheticizing Tendencies in Mid-Nineteenth-Century American Landscape Painting." In The Cultured Canvas: New Perspectives on American Landscape Painting edited by Nancy Siegel. Lebanon, N.H., 2012: 133-134. Corbett, David Peters. "Painting American Frontiers: 'Encounter' and the Borders of American Identity in Nineteenth-Century Art." Perspective 2013, no. 1: 140, 141, color fig. 9.